San Antonians are a savvy bunch when it comes to cooling down, as anyone forced to deal with parking lots that mimic the desolate center of Death Valley can relate. We have raspas, ice cream, expertly placed fans throughout our homes, and pools galore. San Pedro Springs Park, while it may get a bad rap, deserves your immediate attention this hellish, sweat-drenched summer. Here's why. Just autograph a white sheet attached to a brown clipboard before entering, walk through the community showers, and jump in -- it's that easy. Just a two mile bike ride from Downtown, the pool is in a prime spot. Unless they live in Stone Oak (why would they?) your friends and family can't, in good faith, use location or travel distance as a reason not to enjoy the day with you at San Pedro Springs Park. If they do, just remind them it's free. You know those pools surrounded by concrete, melted plastic chairs, and no trees? San Pedro Springs Park is the antithesis of that. 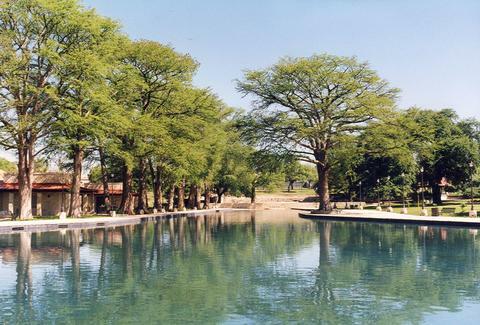 The pool is lined by huge, overhanging Cypress trees that provide ample shade for anyone who needs it. Lay down a towel, put your body on it, and enjoy. While the park doesn't allow guests to bring food or drink into the swimming area, there are plenty of BBQ pits and spots to set up picnics outside. 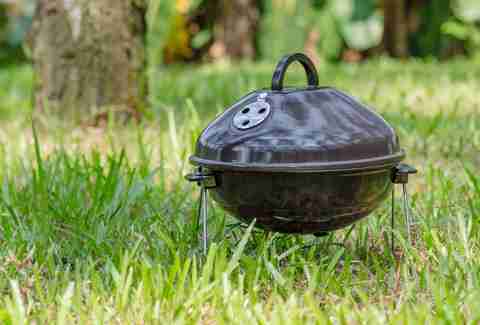 On Sundays you're bound to find plenty of families throwing pork shoulders, hot dogs, and burgers on the grill. Have you strayed from your summer diet? Had too many tacos? Let your back hair grow to extreme lengths? Doesn't matter. 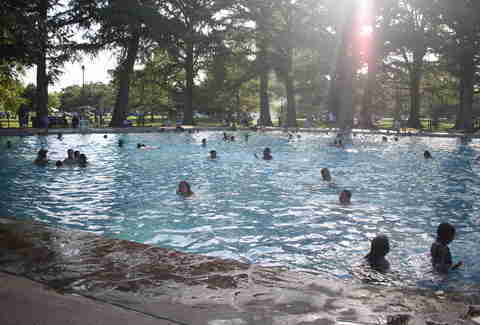 San Antonians come here to find solace from unbearable summer heat, not to cast judgmental glares. No one is looking at your love handles or your never-groomed body hair. They're thinking about how cold the water feels and how heavenly the shade is. San Pedro Springs Park is the second oldest public space in America (only Boston Common is older), and people have used its beautiful, clear waters for centuries. Hunter gatherers lived on the grounds nearby and drank from its springs, Spanish explorers established camps in the late 17th century, and the US Army stabled camels on the property in the mid-1800s. Don't worry about speedo- and swim cap-clad, goggle wearing, aggressive breaststrokers plowing into you -- it's not their scene. One of the best libraries in the city is located next door. Check out one of your favorite books, take it to the pool, lay out on your towel, DO NOT GET IT WET, and read until the place closes. 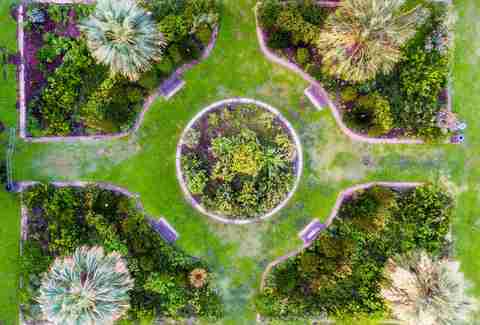 There's a playground, tennis courts, a gazebo, expert landscaping, picnic tables, walking trails, running trails, and a skate park located inside San Pedro Springs Park. If you're bringing friends or family members where everyone has a different preference, you're sure to find something for everyone. When you're done swimming, hit up nearby The Cove, Press Coffee, Southerleigh, Sparky's, or Hi-Tones, just wait a half hour before you jump back to the pool. Work up a sweat running the park's trails and dive straight into the cold waters of the pool. Nothing feels better. If you don't mind dancing in public and prefer to exercise in water, the pool occasionally holds Zumba classes. A common complaint about San Pedro Springs Park is its family friendly nature. It's easy to escape the madness, though. Most families and small children hang out in the shallow end, leaving the south end of the pool for those needing a peaceful experience. Remember the pools from your childhood that burned your eyeballs and turned your hair green? Fear them no more. San Pedro Springs Pool is pumped with nearly 5 million gallons of potable water a year and is treated to swimming pool code standards during the summer, so don't fret about adverse reactions to floating chemicals. Some pools are lukewarm and disgusting to jump into, but not this place. 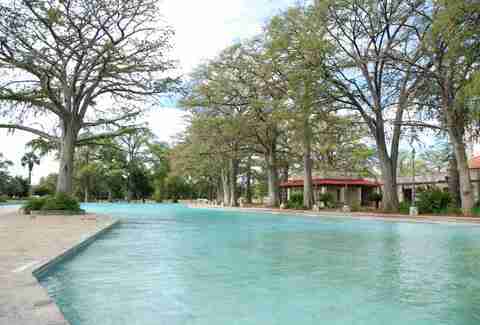 It's consistent with its refreshingly cold waters and well-maintained grounds. 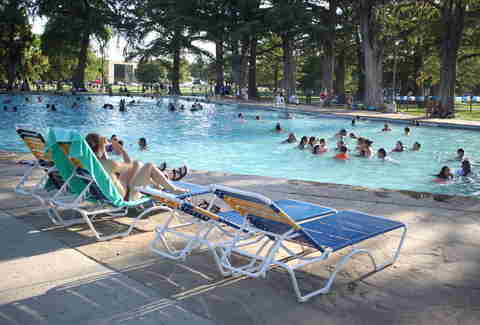 The pool is crowded on weekends during the summer and rightfully so. If you're looking to avoid the crowd, show up around 3pm on a Wednesday and you might have the place to yourself.